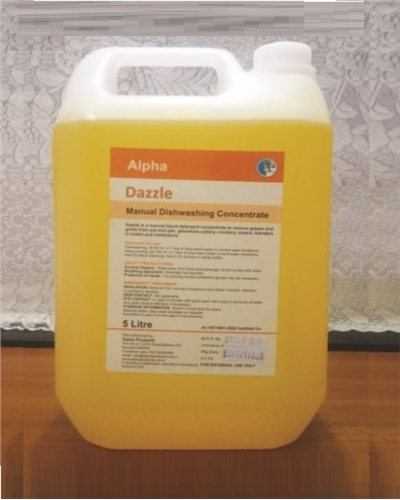 DAZZLE is a manual liquid detergent concentrate to remove grease and grime from pot and pan, glassware, cutlery, crockery, mixers, blenders in hotels and institutions. Dish washing: 20-50 ml. in 1 liter of luke warm water in normal water conditions. Heavy soiling: 50-100 ml. in 1 liter of luke warm water in hard water conditions. Hard Surface Cleaning: Use 2-3% solution in spray bottle. STORAGE INFORMATION : Store in a cool and dry place.